In most states, businesses (whether a Sole Proprietorship or an incorporated business type) need licenses and/or permits to operate and comply with government mandates for safety, soundness and tax. There are many federal, state, local and even regional requirements that may apply to your business. Failure to comply with license and permit requirements can lead to pricey penalties or leave business owners with no legal protection. These requirements vary by industry and also depend on how business is transacted and where the business is located. Be sure to research state and local licensing requirements for your business type and location—or let Laughlin Associates do that work for you when you purchase our Business License Application Package. 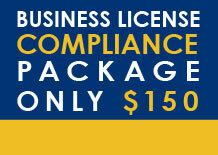 Please note, the Business License Application Package does not incorporate your business. If you'd like to incorporate, choose your desired business type from our Starting Your Business page.